Now let’s look at the follow-through of a pitch shot. After the leading edge of the golf club enters the turf there are two places it can go. First, if the swing was too steep the leading edge will continue to swing further down into the turf. If the clubhead continues into the turf this is referred to as hitting the shot fat. Most of the time if you hit your pitch shot in this manner there will be a layer of turf between the clubface and the golf ball. If you do not make contact with the golf ball first and you make contact with the turf the golf ball will not travel the desired distance. Anytime the clubhead makes contact with the turf first the layer of turf between the clubhead and the face of the golf club acts as a cushion. This cushion is not a good thing. The shot will not be a solid hit. The impact will be weak and the ball will come up short every time. This can be very frustrating! The second place the leading edge can go after it enters the turf is to travel on a line towards the target, not down into the turf but more level to the surface. If you swing the golf club on the correct arc in the backswing and downswing, the leading edge will enter the turf under the golf ball and glide through the turf and come out of the ground a few inches in front of where it entered. After impact with the golf ball the clubhead must continue on cutting through the turf and following through low to the ground. When the clubhead comes out of the turf it has to stay low all the way to the finish. Everything is relative however, if you have a short pitch the clubhead will follow through low and the follow through will be short. On a longer pitch shot the follow through will be longer however but it must stay low to the ground still. Because if the clubhead comes out of the ground too fast and swinging up too much, you will bottom out the arc too much and wind up scooping the ball. The bottom of the arc has to be long and shallow after impact. It can not be a short arc at impact. 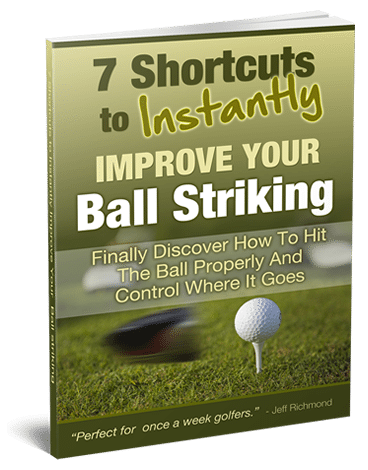 Swinging the clubhead up quickly after impact will cause a thin or topped pitch shot. 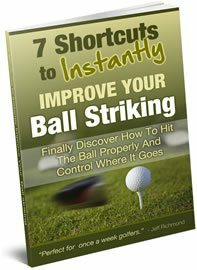 Ok, in the final pitching lesson we’re going to look at the finish of a pitch shot. So make sure you check that final pitching lesson out.